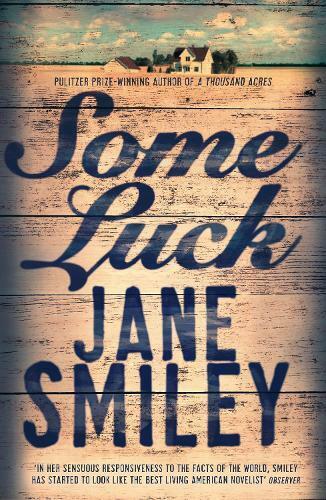 Some Luck may be Jane Smiley’s fourteenth novel, but it’s the first work I’ve read of hers and, I have to say, it’s left me wanting to read more! Set in Iowa, in America’s Midwest, the novel follows a farming family, the Langdons, from the 1920s through to the early 1950s. Each chapter takes us through one year in the life of the family. The story flips from one Langdon to the next, beginning with the patriarch, Walter Langdon, as the family lives through some of the most pivotal moments of American history: the Depression, World War II and the Cold War. Often the narrative is told from the viewpoint of an infant, a device Smiley uses quite successfully. For each of the five children born to Walter and his wife, Rosanna, the reader is given an insight into their young minds, emphasising the individual personalities of the siblings. Like a parent, the reader gets to watch the children grow and develop into remarkable adults. While each child follows a different path, with only one of them choosing the farming life, the children always return to, and are forever emotionally bound to, the land on which they were raised. This novel is essentially about living and getting on with your life, despite what’s thrown at you. There is nothing fast-paced about it, nor does anything overly dramatic occur. Yet, there is something absorbing about it. Finishing the story is almost like leaving some very dear friends behind. Smiley intends this to be the beginning of a trilogy, which will see the Langdon family well into the twenty-first century. I only hope I don’t have to wait too long for the second instalment!